The City of Huntsville continues to thrive. We are the fastest growing major metro area in the state of Alabama and also rank among the fastest growing cities in the Southeast! This growth brings new people and possibilities, but it must be handled with forethought for development that will happen in the coming years. 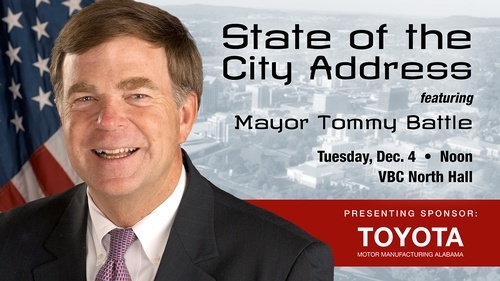 The Huntsville/Madison County Chamber invites you to Mayor Tommy Battle's annual State of the City Address. The mayor will discuss Huntsville's achievements and his projections in regards to our citizens, our schools, and local businesses. Come be a part of Huntsville's successful future! Interested in being a sponsor for this event? Contact Kristy Drake for more information.